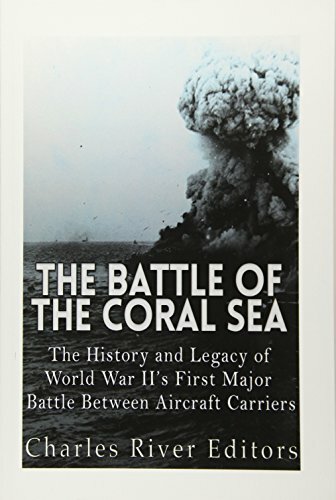 *Includes pictures *Includes accounts of the battle written by participants *Includes online resources and a bibliography for further reading *Includes a table of contents The growing buzz of aircraft engines disturbed the Japanese military construction personnel hauling equipment ashore on the beige coral sand of Tulagi island at 8:20 AM on May 4th, 1942. Offshore, the large IJN (Imperial Japanese Navy) minelayer Okinoshima, flagship of Admiral Shima Kiyohide, lay at anchor, along with two destroyers, Kikuzuki and Yutsuki, and transport ships. Six Japanese Mitsubishi F1M2 floatplanes also rested on the gentle, deep blue swell, marking Tulagi's future as an IJN floatplane base. The men on the beach, at inland construction sites, or aboard the Japanese ships, looked up towards the huge white cumulus clouds sailing on the ocean wind. Taken completely by surprise, the Japanese stood and stared as 13 sturdy-looking dive bombers dropped through the cumulus layer at 6,000 feet, plunging towards the IJN ships. As they streaked lower, the white star on a black disc insignia of American aircraft grew visible on the underside of each wing. As the dive bombers roared low, drowning out the soft clacking of palm-fronds agitated by the steady sea breeze, the dark capsule shapes of 1,000-lb bombs broke away from their undersides and hurtled towards the anchored ships. Amid the sudden thunder of explosions, huge fountains of white foam gushed upward, sparkling in the tropical sunlight before collapsing back into the sea. Only as the American Douglas SBD-3 Dauntless dive bombers began climbing out of their attack did the Japanese finally open fire with the four anti-aircraft guns set up on the Tulagi shore. As Lieutenant Commander William Burch, leader of Scouting Five from the carrier USS Yorktown, later reported, &#x201c;We took them by surprise, and they didn't start shooting at us until we pulled out [...] We hopped back over Guadalcanal, and landed aboard. [...] Only one plane had been hit by anti-aircraft. Its sway braces on the bomb rack were damaged. A couple of the dive bombers were attacked by a fighter on floats, but they shot him down. It was the only enemy plane we saw. What's more, I didn't see a ship sink.&#x201d; (Ludlum, 2006, 70). The Japanese, attacked throughout the day, radioed this information to the IJN task forces operating in the area. The unmistakable US carrier aircraft meant an American aircraft carrier sailed nearby, surprising the Japanese, who had not expected any enemy &#x201c;flattops&#x201d; in the Coral Sea near Australia at that time. In fact, the airstrikes on Admiral Shima's Tulagi invasion force marked the start of the strategically important Battle of the Coral Sea. While the Battle of the Coral Sea is not as well known as other battles across the Pacific, it set a precedent by pitting enemy aircraft carriers against each other, a battle in which the rival navies themselves never sighted each other or fired a gun at each other. Instead, the fighting was done with the carriers&#x2019; aircraft, something that would become more common over time and would result in decisive actions at places like Midway just months later. Furthermore, while it was in a sense a tactical victory for the Japanese, it would end up helping blunt their aggressive push east in the Pacific, making it a crucial strategic victory for the Allies. The Battle of the Coral Sea: The History and Legacy of World War II&#x2019;s First Major Battle Between Aircraft Carriers analyzes the historic battle and the strategic importance it had in the Pacific. Along with pictures of important people, places, and events, you will learn about the Battle of the Coral Sea like never before.